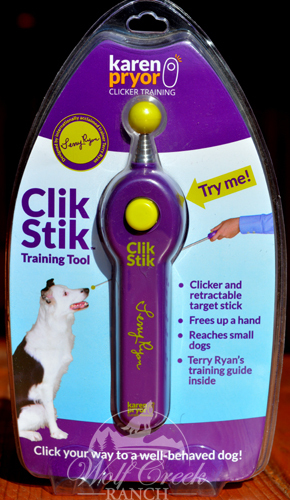 Click your way to a well-behaved dog with the Clik Stik all-in-one clicker and retractable target stick. The Clik Stik Training Tool is a clicker on a collapsible stick--perfect for trick and target training! Target extends from 6 inches to 23 inches, and handle includes a belt clip for easy carrying. This versatile target stick designed by renowned trainer Terry Ryan is now being manufactured under the Karen Pryor Clicker Training name. Many of the things we want our dog to do in agility and obedience requires the pup to focus on an object or location. Targeting is also helpful as a way to get your misbehaving or fearful dog focus on something else (the target). Touch/target sticks are the perfect training tool. Clik Stik was designed as an easy to use alternative to the traditional target stick. Many find it difficult to handle the traditional target stick and coordinate the clicker and treats. Clik Stik's combination clicker and retractable target stick frees up one of the trainer's hands and means one less piece of equipment for the trainer to juggle. The Clik Stik is fully telescoping. Target extends from 6-23 inches, and handle includes a belt clip for easy carrying. At full extension (23"), the Clik Stik reaches the nose of short dogs when the trainer is standing. The sound of the Clik Stik is less percussive than some clickers, producing a softer sound, which may be helpful in working with sensitive dogs. The Clik Stik includes an Instruction Guide written by Terry Ryan. Karen Pryor is the CEO of Karen Pryor Clicker Training and Karen Pryor Academy. Karen's 40-year career working with and educating scientists, professional trainers, and pet owners has changed the lives of countless animals and their caretakers in zoos, oceanariums, and pet-owning households. She is the author of six books, including Don't Shoot the Dog!, the "bible" of training with positive reinforcement. Her most recent book, Reaching the Animal Mind, describes how to bring out the undiscovered creativity, intelligence, and personality of the animals in our lives. Karen lives outside Boston, Massachusetts.